Whats up with all these chickens on Kauai? A great question, and while we have residents who adore the scrawny, colorful creatures, there are quite a number of us who believe they look best alongside carrots and potatoes in a nice winter stew, and not in our parks, front lawns, and protected habitats. In an earlier post we highlighted endangered coastal birds of Kauai and their struggles to maintain a foothold in their native habitat. No such trial for the common chicken. Chickens have been here a long time and I suspect will be here long after I depart this good earth. Most of us here have quietly endured their crowing, which if you are new to country living, will soon discover they crow at all hours of the day and during full moon events. Are the chickens on Kauai Hawaiian? … they are now. Before you start to hurl that banana at them, local chicken whisperers remind us that they are part of our connection to the ancient Hawaiians who brought the moa to the islands from the Marquesas nearly 1000 years ago. Along with banana and taro tubers which can survive for weeks on an ocean voyage before being planted, the chicken too survived the long journey with minimal food and water. It was an ideal source of protein to the early settlers, and like humans easily adapted to these welcoming islands. Little remains of the original Polynesian chicken lineage, you would be hard pressed to find any DNA of the Polynesian breed that accompanied the Marquesans to Hawaii in our Kauai chickens. A great many breeds have been introduced to Kauai with the coming of European settlers in the 1820’s. Until recently it was easy to ship them through the US mail. Only in 2007, when the Federal government enacted the Animal Fighting Prohibition Enforcement Act stopped this practice. Most of the newer arrivals were hailing from Arizona, New Mexico, and Texas where there is a long history of cockfighting. The current population are mixes of the Cubalaya which originated from the Philippines and Rhode Island Reds. 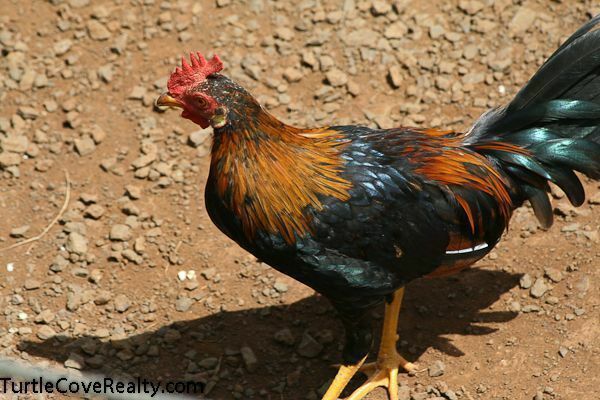 The Cubalaya is a trainable bird for cockfighting and the Rhode Island Red is a hardy utilitarian breed that produces high quality meat and eggs. A common belief is that the destructive winds of Hurricane Iniki in 1992 scattered the beasts throughout the island. Not so. The real reasons for the population explosion is the lack of a predator and humans. Unlike the other major Hawaiian islands, there is no mongoose to keep the population in check, and lastly, people are the primary ingredient in the imbalance. People throughout the years have fed the chickens creating an unnatural population explosion, it’s simple, more food equates to larger clutches. Chickens are destructive to our native plant and animal species. They compact the earth while removing topsoil in their search for seeds and insects and they carry avian pox which is deadly for our native bird species. We hope that you do not feed them while you are on the island. Make them work for their food and this will naturally reduce population size. A misconception is that the meat is tough and unpalatable. The local chickens can be delicious, but the preparation is lengthy and may not be worth the effort. Similar to going to your mother in laws house for dinner, which lasts only 9 minutes, and then enduring 4 more hours of how “we used to do things”. Firstly, catch the wary and speedy creature. Secondly, feed it only high quality chicken feed for approximately one month. Finally, it needs to be steamed or pressure cooked to breakdown the muscle fiber. Want to learn more? Here is a great traditional Filipino Chicken Adobo recipe. Full disclosure, no chickens on Kauai were harmed for this post. Let us know your favorite chicken story. Lee Morey, is the Principal Broker and owner of Coldwell Banker Turtle Cove Realty in Kalaheo Kauai. She has represented buyers and sellers successfully for over 20 years in Kauai. She prefers her chicken baked or BBQ’d.